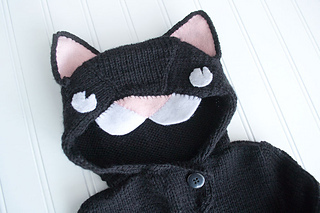 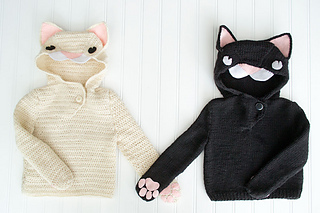 A free pattern published to celebrate the launch of my new pattern website 100babypatterns.com, this adorable cat hoodie can be knitted up in time for halloween to keep your baby warm and snuggly while looking cute as a kitten. 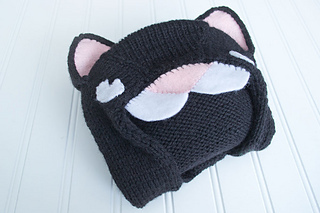 Meow!~ It has a super cute cat eared hood with appliqued embelishments and features options for closed sleeves (to look like paws) or regular sleeves for fussier kittens. 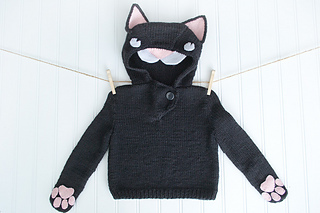 PS: There is a Crochet version too.